<?xml:namespace prefix = o> If your email system stops receiving mail, or you get a call from a client or friend with a report that the email message they sent you has bounced back, you need to check to make sure your mail box is not full. A normal email box will store thousands of simple text email messages and last for months. If your received email contains many large attachments then it will fill up quite quickly. Note the eMail details shown in the upper right hand corner of the screen. 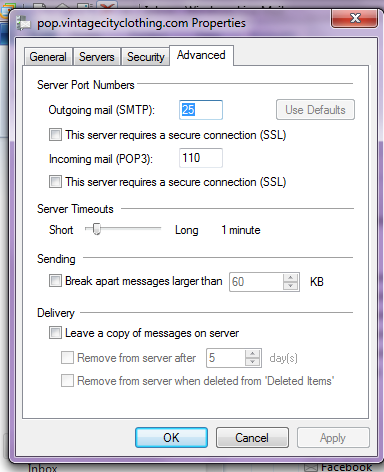 If you use MS Outlook or any other email client to send and retrieve your email, your mail boxes could still fill to capacity over time. 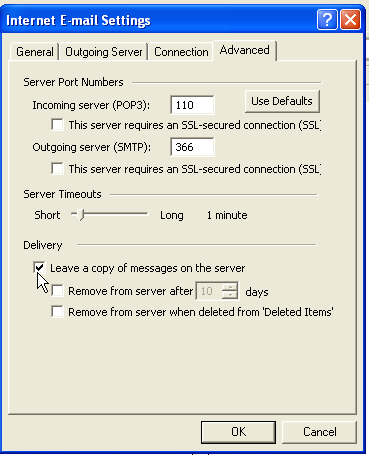 Check your Outlook Internet E-Mail Settings under the tab. Uncheck the box so Outlook will clear out the mail automatically.